As readers, we have our favorite authors, favorite books, and favorite bookstores. I want to pay tribute to author Brian Jacques in this post for the letter J. Any bookstore worth its salt can place the Redwall series in your hands. Though Jacques died in 2011, he continues to bring customers through the door in search of Redwall. 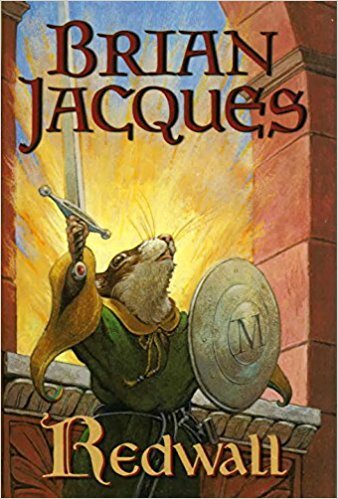 Garnering generations of readers, Brian Jacques, the author of Redwall (1987) and some 20 sequels have sold in the tens of millions touching adventure-loving kids all over the world. His formula—a quasi-medieval fantasy setting in which peace-loving mice and other small animals seek adventure and fend off endless attacks by evil foxes, rats, and weasels is an older child’s classic read like A.A. Milne and Beatrix Potter for younger readers. Next time you are in a bookstore, bring home a copy of this book and read it before giving it to a child in your life. For you book collectors: The 10th Anniversary celebration of Redwall in 1997, the original publisher of the series, Hutchinson, re-released Redwall in a special collector’s edition in the UK. The hardcover book was bound in green leather with a pictorial front board and included new illustrated color plates. The book also retained Gary Chalk‘s original chapter illustrations. 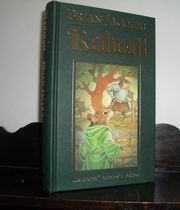 It is sometimes referred to as the “Redwall Illustrated Collector’s Edition”. If you have a favorite author whose last name begins with J, and can be found in most bookstores, please share it below in the Leave a Comment section. Thank you. This entry was posted in Ato Z Blog Challenge 2018 and tagged AtoZ Blog Challenge 2018, Brian Jaques -author, The Redwell Series-Author Brian Jaques. Bookmark the permalink. How have I never heard of this book! You have a treat in store when you can look at the series and read further if this is for you. I hope it turns out to be a great find. Happy reading. Serendipity at work here. I couldn’t think of an answer so went to my shelves to see what I had under J and found Willie Hogg by Robin Jenkins which I had totally forgotten about. It doesn’t fit your criteria – it’s probably out of print – but you’ve just helped me find my next (re)read. It’s about an elderly Scottish couple travelling to a Navajo reservation in Arizona, a setting I hadn’t visited when the book came out, but which I have since, so it will be interesting to see if that affects my view of the book. Don’t you love this about books? I have always loved the saying when the student is ready, a teacher will appear. Well, I feel that way about books that may be waiting on the bookshelf for just the right time for me. Glad you reclaimed Willie Hogg. This is what I love about the AtoZ Challenge that it introduces me to a world of subjects and themes that are new to me. Like me, I’m sure you feel there are so many books to read, and never enough time. Come back to the BOOKSTORES when you can this month. Indeed I will ! I actually find a distinct difference in the styles of writing between the different peoples who write in English …. and I enjoy this difference . That book reminds me of some of the books I had as a child with their gorgeous illustrated covers. Half the fun was looking at the illustration and letting it feed your imagination. I had a Classic series that included beautiful illustrations. To this day, I have collected children’s books illustrated by our modern artists. I have found a wonderful blog during the #Challenge and here is a link to a GREAT post written about the MAPS included in the Redwall Series. Treat yourself to this and while you are on the blog look at the fabulous things she has written about maps in Children’s books. You will love it.